When it comes to setting the stage for optimum adhesive performance, a safe eyelash extension application, and long-lasting eyelash extensions, humidity plays a larger role than most Lash Stylists or Consumers think. To eliminate the potential for humidity negatively impacting your eyelash extensions, your line of defense is to control and regulate your environmental humidity and arm yourself with application knowledge that allows you to adapt and counteract the potential negative impact. What role does humidity play with lash extensions application? The speed at which your adhesive cures during your lash application. Reducing the potential for adverse reactions to you and to your client. The strength and longevity of your extended lashes. By maintaining a controlled environment and keeping humidity in the ideal range, this helps reduce the chance of irritation and other adverse reactions during and after your lash application. This also promotes optimal performance of your adhesive that results in strong, long-lasting eyelash extensions. Ideal Humidity, a song written and produced by Xtreme Lashes Trainer, Dana Bacon. Your eyelash extension adhesive (glue) relies on moisture in the air to work properly—it needs moisture to attach. Simultaneously, your adhesive releases particles into the air in the form of fumes that are attracted to moisture. These particles will migrate towards your mucous membranes in search of moisture to bond to (thereby causing an adverse reaction) UNLESS you provide these adhesive particles with an alternate “moist” place to go to. She goes on to explain that since cyanoacrylate fumes (generated by all cyanoacrylate eyelash extension adhesives) are attracted to moisture, if the humidity in the air is too low, then adhesive fumes, in their quest for moisture, will migrate to the mucous members within the eyes, nose, and mouth. This may lead to adverse reactions ranging from mild burning and tearing of the eyes to an inflammatory reaction as evidenced by signs and symptoms including burning, heat, pain, red eyes, puffy eyelids, and even an allergic reaction. Note that both you and your clients are at risk of adverse reactions from lingering fumes in your lash application work area. Some Lash Stylists and consumers are more sensitive to these fumes than others. Keep your humidity level between 45% – 60% so that excess adhesive fumes bind to water vapor in the air instead of binding to the moisture present within the mucous membranes of the eyes, nose, and mouth. Keeping the humidity level between 45% – 60% minimizes the chance of adverse reactions, resulting in an ideal application environment for both you and your client. To help simplify daily humidity and adhesive fume management, the Xtreme Lashes Application Environment System, was created to provide all the tools necessary for you to do just that. The components of the Application Environment System include: the Air Cleanse, Hygro Thermometer Clock to measure your humidity levels, Air Flow Fan, and Mini Fan. When used together, the Air Cleanse, Hygro Thermometer Clock, and two Fans push fumes away from your and your client’s face. 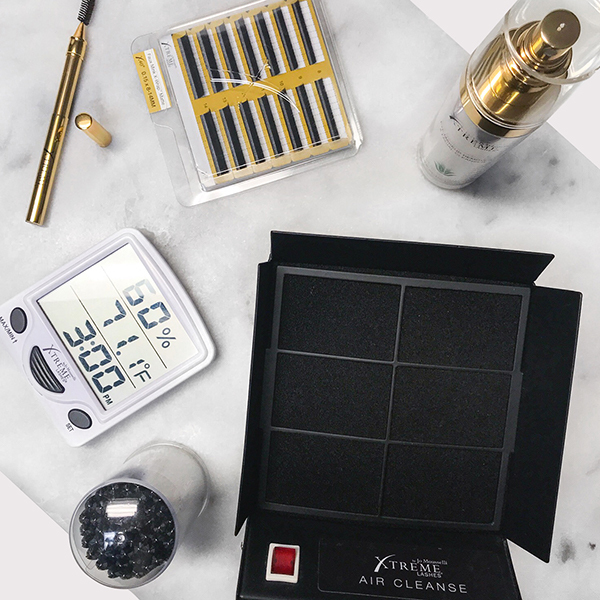 The Air Cleanse not only extracts adhesive fumes, but also helps remove environmental irritants and allergens including dust, pollen, and other smells/fumes from beauty services happening nearby from your work area. This innovative product uses an advanced carbon filter, therefore to maintain its performance, be sure to follow provided usage instructions and change its filter periodically. 1) What should I expect to see when humidity is too low or too high? Adjacent lashes may end up sticking to one another. This is caused by the adhesive taking too long to cure during attachment. Lashes may lean or slip. Lashes might lean to the side or slip upon placement. You’re not going to feel that instant, magnetic attachment. Increase in adverse reactions. This includes eye tearing or burning to inflammation and allergic reactions. Blooming. This can happen when humidity is lower than 45% and adhesive fumes migrate towards your client’s eyes causing irritation and tearing. When this happens, it’s a vicious cycle of more tearing and more blooming. Like mentioned before: wherever water flows, adhesive goes. Poor attachment. The adhesive may partially cure before you’re able to attach, resulting in lash extensions not attaching well. This is evidenced when lash extensions pop off during the grooming process before your client leaves and/or popping off prematurely between lash extension refills. Adhesive beads “cure” in place and look clumpy or rough. The adhesive may not envelop around the natural lash properly. You may still see beads in place even after you’ve attached, resulting in what appears to be clumps rather than a seamless attachment. In addition to not being visually pleasing, the gaps between the adhesive beads can also result in a weakened bond. Blooming. This can also happen if humidity is over 65%. It will appear on your adhesive tray and on the lash extensions. In summary, if you’re faced with a situation where humidity is either too low or too high, your line of defense is to combine humidity control using the Application Environment System and work in a well-ventilated room to optimize the performance of your adhesive, while minimizing potential adverse reactions for you and your client. 2) How do I control and regulate my humidity to minimize the potential for adverse reactions and maximize adhesive performance? Invest in the Xtreme Lashes Application Environment System and work within a well-ventilated lash application station or room. Maintain humidity between 45% – 60%: add humidity to your lash room using a humidifier or reduce humidity by using a de-humidifier. 3) What do I do if I just cannot keep it within the 45%-60% range? If you’ve tried everything, and you’re still struggling to reach the ideal humidity range, do not fear. It doesn’t mean that you’ll have to reschedule your client. It’s important to understand that you’re going to experience environmental changes, especially as the seasons change. It’s about learning how to adjust as a Lash Stylist to get the best out of your adhesive and the most for your client. One of the most effective adjustments you can make is the amount of adhesive to use. This means altering your adhesive coating technique. If your humidity is too low, you’ll need to pick up LESS adhesive to speed up attachment. Fortunately, it is also easy to add humidity by investing in a humidifier (even a baby humidifier works). If you are unable to reduce high humidity, pick up MORE adhesive to slow down the curing process. Or, work more quickly. Be mindful though, that unless you naturally work at this speed, trying to force yourself to work faster may result in sloppy work. Lastly, similar to the tip above, you can also invest in a de-humidifer to reduce humidity levels. Become an Xtreme Lashes Lash Stylist and get even more tips, training, and business development coaching. Join us today.